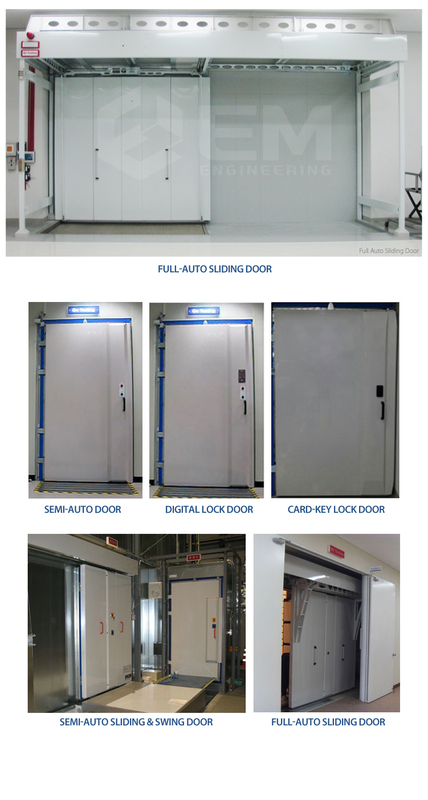 ﻿ RF Shielding Door | EMC Facilities Business, EMC/EMI Chambers | EM ENGINEERING INC. The RF Shielding Door is composed of Door frame and Door. The all connection side of door is treated with metallic gasket. - Certificate of Utility Model & Design Registration. - Digital Lock or Card-key Lock is available. - Threshold Bridge / Heavy Load Option is available. - Absorber / Ferrite Tile Inside Option is available.
" Door Open & Close Structure for Electromagnetic Wave Test Chamber "
EMC Facilities Business, EMC/EMI Chambers | EM ENGINEERING INC.